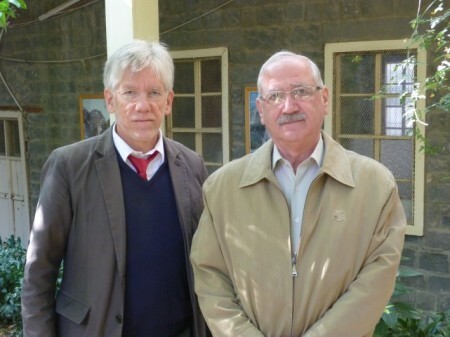 Dr. John Eibner is the CEO of Christian Solidarity International USA and member of CSI’s International Management. He has directed research and advocacy campaigns on behalf of endangered Christian communities in the Caucuses and the broader Middle East, and has traveled into the Sudan over 100 times to document and combat its slave trade where he was involved in efforts that freed tens of thousands of Black Christian and traditionalist slaves. He has recently performed aid-delivery and fact-finding missions in both Syria and Iraq. Following Joel Veldkamp’s recent illuminating article about the SSNP for Syria Comment, I want to offer two footnotes in the form of comments given me by Nouhad Samaan, head of the SSNP in Homs. I had an encounter with Mr. Samaan on the 20th of November, 2014 while on a trip conducting visitation to CSI’s humanitarian aid partners in Damascus, Saydnaya, Maaloula, Homs, Wadi al-Nazara, and Tartus. The doings of Syrian political parties were not on my agenda, as all of my meetings were with displaced people, volunteer aid workers, church personnel, and the Grand Mufti. However, CSI has a strong interest in helping create conditions for the return of displaced Syrians to their homes, and my curiosity had been aroused after hearing from friends that the SSNP has been rapidly gaining popularity among secular-minded Syrians, becoming a political force of some significance, especially, though by no means exclusively, within the Christian community. I had also taken note in old Homs of the SSNP logo sewn on the sleeves of uniformed soldiers at checkpoints, and stamped on the side-walls of streets. I therefore accepted an offer to meet Nouhad Samaan, the primary SSNP leadership figure for Homs, who now carries significant responsibility for governance in a strategically-important city center. Mr. Samaan was eager to promote awareness regarding efforts his once-banned political party has been making, following the evacuation of rebels in May 2014, to shore up security and create conditions for repair and reconstruction in the thoroughly-ruined old city of Homs. The Syrian Social National Party (SSNP) has a long history of opposition to the Baath Party, and has paid dearly for it over many decades. But in the current crisis, the government felt they needed our party because we face the same enemy—one that wants to destroy all of us who represent secular principles and the rights of minorities. The threat is existential. From the earliest days of the anti-government demonstrations in the spring of 2011, we detected that a strong undercurrent of religious supremacism had been unleashed. We are very sensitive to this problem. It is one that has plagued this part of the world for the past 1,400 years. The Damascus massacre of 1860 and the genocide of Christians 100 years ago marked high tides of this destructive phenomenon in modern times. In response to the current high tide of sectarian intolerance, our Party decided to cooperate with the government. The SSNP was legalized already in 2005. But our acceptance of responsibility for governance in certain areas dates from the autumn of 2013. Our party, like all the historic parties in this part of the world, has always had a militia. The SSNP militia participated in the military operations that drove the rebels out of the predominantly Christian village of Sadad, near Homs, in November 2013. The rebels had religiously cleansed the village. But once Sadad was under the control of the SSNP forces, the Christians were free to return. After the expulsion of the rebels, President Assad accepted the presence of the SSNP militia as the force to guarantee the security of the Sadad and its environs. The same thing happened in Saydnaya and Marmarita. After the evacuation of rebels from the old city of Homs last May, the SSNP assumed the leading role in providing security and establishing an infrastructure to support the return of the local population. Security, of course, was the number one priority. We had to deal with booby traps left behind by the rebels and ward off bands of thieves. The old city has been so badly damaged that fewer than 2,000 people, out of a pre-conflict population of 150,000 have been able to return to their homes. We are still in the phase of cleaning up the mess. Most dwellings are currently uninhabitable, and many side-streets are still littered with debris. But clean-up is well underway, a few shops have reopened, as have two schools, which now have about 300 students between them. One of our great challenges will be to create conditions in old Homs that will encourage the minorities to return to their homes. After what has happened to them, they feel vulnerable and insecure. The Christian community is a source of stability. The destruction of the Christian community would therefore lead to yet more instability. The demographics of Syria are changing, and it is not for the good of the country. The two schools that have reopened in Homs are state schools. If the Christians are able to reopen their own schools, it will be a great incentive for Christian families to return. Right now the churches do not seem to have the funds to rebuild and run Christian schools. I am an Orthodox Christian, but we have members from all of Syria’s ethnic and religious groups. While the SSNP was founded by a Christian, the SSNP leader here in Syria is currently led by a Muslim, Nazir al-Athma. In fact, the martyr whose picture was posted with the Syria Comment article was not a Christian, though he fought and died in Sadad, a “Christian” village. The three martyrs that died before him in Sadad were also non-Christians. They were from three different religious groups: Shiite, Sunni, and Alawite. We have martyrs from all the various communities. Members of our multi-ethnic and multi-religious party have fought throughout Syria. Regarding our role in the Lebanese Civil War, yes we were supported by the Syrian regime back then. But our involvement in that conflict was based on two principles: Firstly, we were part of the Lebanese resistance front against the Israeli occupation, acting in support of Palestinians rights. Secondly, we were opposed to the radical sectarian groups in Lebanon such as Kataeb and the Lebanese Forces. As Joel Veldkamp observed, the current role of the SSNP merits further research. With the Levantine and Mesopotamian state system in disarray, and with the rise of a new de facto Sunni state in the region, it will be interesting to see whether there is place in the new emerging order for a historic party whose nationalistic ideology is based neither on Islam nor Arabism. I do not know on which planet this latest blog lives. The late Assad destroyed every political party either by force or by coopting or by corruption leaving the political sphere and space of Syria an empty barren desert and without life. The current leadership went further by gutting even the remains of the Baath party that actually provided for the poor and rural members a way out of their predicament and changed it into a free for all ultra neoliberal economic bonanza of graft and corruption. The utter failure of the secular parties to achieve anything from the day of April 17th 1945 when Syria become independent with an average of one coup d’etat every 9 months until the late Assad had finally eliminated all the other rivals. The inability of all these parties to create a true lasting national identity and to establish the rule of law, freedom, justice, education, progress, and independence coupled with the abject defeat of 67 had led to the rise of alternative thought. The Iranian Islamic revolution was and remains the catalyst that brought the idea of political Islam as the alternative with the toppling of the Shah, the ability to withstand sanctions and war, and the ability to take advantage of events on the ground. So what we have now is the collapse of the old structure that was created to keep the region inherently unstable. Iraq and Libya unravelled, Lebanon and Syria are teetering on the brink of disintegration. The Baath the SSNP and all the others are just fronts for minorities to have a political structure hiding behind false secularism. If you scratch the surface and I have said this before, you will find that the minorities are all asking for the majority muslims to be secular while they retain their peculiar sect based identity. You cannot have it both ways. Either it is a Republican system based on democracy and equality under the law and without consideration of privileged status or protected status for a peculiar sect or you remain sect based system of power sharing as it is in Lebanon. The later is bound to collapse as the protection of the minority is not written in a constitutional framework that guarantees that a majority will not crush the minority and that equality under the law guarantees equal opportunity and meritocracy. The system will collapse as it is based on sectarian clientelism and warlordism with a weak central authority and muddled national identity. This is why in the face of the utter failure and collapse of the creation of these artificial countries and their inability to secure a safe haven for the minorities which deserve a full life and equal opportunity and full citizenship without due regard to creed or color or anything else but merit, a new wave is sweeping the region. Like a resurgent Russia and vindictive Putin the Sunnis although a majority feel like a minority and hence they will sweep the region with this new idea that Political Islam is the way to go after the failure of all other systems. This is why, spending a trillion dollars to bring the region from the 13th to the 14th century and that includes every minority along with the majority of the people living in the ME is not my idea of US engagement. Obama was right when he said that there are no moderates in Syria’s opposition. Likewise there were never any moderates amongst the minorities of the ME either. One last note, as for my bringing the minorities into the discussion, I am sorry, but it was and remains the minorities that think only in the prism of minorities and have never been able to rise above their old age hatred and prejudiced jaundiced views. All of them were persecuted, but instead of showing and discussing and debating their persecution and making sure that this important history is discussed openly and attempting to turn the page and start anew, they fell victim to their eternal paranoia and concluded that they only way that they can secure their future is by dictatorial oppressive and imposed state structures. OBL has won. His ideology has taken root. Plunging head first into the quagmire of the ME is what he wanted us to do. Spending a trillion has exhausted us. Another trillion will be spent on the veterans of endless wars in a land that was created after WW1 so that ” Peace to end all Peace” remains a source of world instability. As for insults; wow, talk about a mentality so locked up in ancient hatreds that any discussion is dismissed as insults. There are direct flights between Tehran and Damascus and many flights between the US and Lebanon and then on to Damascus by road; a road built by the French in the 1930’s and since then barely improved upon by the succession of “secular” regimes in Lebanon and Syria. all you stated above is blur..and you dont have the complete info..
the political parties are and always have been fighting each other in every form to gain power and establish thier views. nothing to do with minorites..the most members in BAATH and SSNP are sunni which are not in any way minorities. democracy is not the best system..democracy needs some baselines and understaning between all the people like …identity .map of country..heratige..
SSNP has now a golden opportunity to contribute to the mechanism of political evolution in Syria,therefore it is so vital to project it’s values correctly and represent the broader spectrum of the Syrian society,the focus should be on Syrianism and religion should never be mentioned in any of its meetings,if they are really serious about giving Syrians back their sense of patriotism. Much of what we see is about money, food and water. This is why we have not seen a revolt in oil rich countries, governments with extra cash are buying peace by keeping the stomach of potential rebels full. Water, or the lack of it, has been and will continue to be a critical part of current and future conflicts in a region that is thirsty and hot. Albaath under Assad became a family business which hired loyalists and servants who looked for jobs elsewhere and found none, some of that is due to a long history of Alawites being mostly farmers, then soldiers and government workers, and Sunnis taking most skilled labor jobs. Militant Islamic ideology mostly appeal to rural, poor and uneducated Sunnis, Most Urban Sunnis who accepted, or pretend to accept, political Islam are often corrupt individuals looking for fame and recognition, others are simply reacting to the Assad’s regime long history of brutality and nepotism. To get out of this mess war needs to stop and Assad needs to accept the concept of sharing and elections which may or may not keep him in power, for Syria’s sake it is better that he let another figure occupy the office of presidency as long as there are checks and balances and the army and security forces are not handed on a silver plate to KSA and Erdogan, Syrians need a period of healing and recovery during which security and order, in big cities at least, must be restored then we may be able to afford the luxury of democracy. Hungry and terrified people are not capable of voting. 1- Change in the Syrian political landscape is a necessity, and if you see the rise of the SSNP, that falls within logic. Sorry al-Assad and his supporters did not listen to you. Take it easy and learn how political systems develop in times of civil wars. 2- Minorites include Sunni seculars (al-Assad has tons of those with him, come deny them now). Sunni seculars from the countryside is leaving it because of the dominance of the Islamists. 3- There have been a sectarian cleansing in Syria and Iraq…(In Iraq for more than ten years)…. It all happened at the hands of the sect that you came from, who is the almost 100% majority in areas of Syria and Iraq. 4- Your logic could be classified as: Romantic/pouty interpretation of history. Sorry political systems do not follow your model. 5- Huge parts of Syria and Iraq are under Islamic Shari’a laws. Kids go to Jihadi schools. There is no more schools like that that were under al-Assad or Saddam, you have Islamic courts. 6- Keep on not seeing the crazy Islamists, who happen to be from your sect, and who want to dominate the world. Russia, China and Iran will remain in the eastern Mediterranean near the Syrian coast forever. This document thus reveals that in the name of maintaining regional peace, a new Great Game is at play. To counter Russian and Chinese influence while cementing influence over its Arab allies, US military strategists are contemplating the threat of war to redraw the Middle East’s energy architecture around Israel. Islamists are not much different from zionists, they use religion to advance their political agenda knowing very well that political Islam is incompatible with democracy. Albaath was hijacked by leaders like Saddam and the Assads but the problem is that the counter movement advocated by Islamists was worse, that is why I see the past 50 years as a collective failure of all political movements in the Arab world. In theory a nationalistic party would be a much better solution than a religious party but for that to work you need national leaders who believe in the concept of democracy and equal political rights of citizens regardless of their ethnic or religious origin, that requires giving Kurds their political rights even if that means allowing them to have their own government. People who push for sectarian and religious agendas are not interested in freedom and democracy and can not be trusted to be agents of change if we are talking about a positive change. Those who want Assad family rule to end are two groups: genuine reformists and opportunists who say something but want something else, they are lying and using the failure of dictatorships to sell the public a defected, and a worse, product. Notice how the Assads appeased the religious Sunni establishment while they imprisoned secular political activists, that was an assault on civil society which helped Islamists to ascend at the expense of seculars, Syria needs both groups out of the government but that will not happen overnight and can not be done as long as there is a war. If you want a new and pleural government to emerge you should work to stop this war first, violence in a society like Syriia can not produce freedom and democracy. There was a period and I stand corrected whereby the rule of law seem to attempt to see the light of day. It all ended in 1958 with the Union and then the Baath. However, this time was mainly in the cities and never truly extended to the rural parts and all the country. There was prejudice a plenty. Now this article in the Washington Post seems to argue that the diversity of the religious and political spectrum of the region has actually worked very well to allow for minorities to remain in the region. It actually is a well thought out discourse that mixing religion and nationalism is the big danger of the Sunni Islamist movements. My post tends to concur that religion and politics do not mix and lead to a powder keg to explode. However, several points of the article go against my points and hence the debate is on. 3. I am superior to all of this. Well it so happens that when they arrive in the trauma center they are shell shocked: all of their premises are brazenly crashing on their broken heads. Hence, in their shock to realize that they are neither invincible nor superior when bad things happen to them they of course blame the pebble on the road that caused the crash. Well I would say the latest visit of the boy prethident to his troops tells a huge tale of the teenager mentality pervasive amongst his clan and supporters that the security house of cards has crashed and that neither security nor prosperity will be attainable. You could tell that he is rather in bad shape as well as his troops. If this all they could get at, then this is great news. So, we have accusations of age old persecutions, ethnic cleansing, invasion by foreign families imported to dilute the indigenous population, and of course the dehumanization of the other the first step in the permissive ideology of genocide and exclusion and enslavement. Typical teenager mentality where it not so crude and so barbaric. The truth eventually comes out, remember the lies about rebels protecting Churches in Kessab ? remember: you can not make chicken soup from chicken poop !! 2- Bashar al-Assad showed guts when he went to visit his troops, what you say and consider is your personal “insight,” the truth stands that he went and visited his troops, you were sitting on your couch. 3- You insisting on calling Bashar al-Assad as Bashar al-Athad is a teenager like behavior at best. Who cares how he pronounces or speaks? It is not a competition in how you speak! This in America is like you are making fun of someone with special needs. This is a very teenager-like behavior. So, if we look and see that you have done this repeatedly for the last three years we could say with some truth that your behavior is teenager like. Sorry to spell this news to you. 4- It is obvious that you do not see what had happened to the minorities in the middle east. Look at what happened, and happen to the many different groups in Iraq and Syria. 5- While you were giving us lectures about Sykes-Pikot, the area had changed for a long times to come. 6- As a person from a minority, there was not a day that I did not read that some one threatening the minority I came from with extinction. 7- All of the above reasons make most of what you scribble ya observaar nothing of important to me just because you always try to derail and not to engage in an intelligent debate. I would like to let you know that i will not post under the name Norman , as somebody else is using it, i will chose another name so there will not be any concern about my position. Norman, you can continue to post comments as normal with the same name; I have blocked the other Norman from posting with the same information. New Norman, you’ll need to choose a different name to post with, along with a different email address. I’m sorry to make you do this, but Original Normal has been active for many years, and has posted 5,620 comments. You have posted 12 comments, beginning this past October. If I had noticed this earlier, I could have saved you the inconvenience. Just create a new name/email and you’ll be welcome to continue posting. The SSNP is a dead parrot. It continues to exist only in the pages of SC. (From previous post). You are absolutely right. It is about the family, the tribe, the sect etc. As depressing as it is, we have to adjust to this reality. I disagree. Islamists, by definition, adhere to Islamic law, which doesn’t treat non-Muslims as equals, nor allows for freedom of speech and expression. Zionists do not use “jewish law” to governn, treats all citizens equally and allows for freedom of expression. If you can find a Jewish government minister of parliament in a Muslim or Islamist organization/country, who is also allowed to denounce his own country, let me know. Israeli arab ministers denounce Israel on a daily basis. Today Syrians who want to enter Lebanon have to explain and show evidence why they want to cross the borders. As much as I hate to see more restrictions on Syrians who are desperate I have to admit that this decision by Lebanon was expected after very little was done by the ” friends of Syria (aka anti regime powers) ” to help Lebanon accommodate 1.3 million Syrians who are now more than 25% of the population. The tipping point was when some Syrians inside Lebanon took up arms and attacked the Lebanese army and worked with terrorist groups that sent car bombs to Shia civilian areas and kidnapped Lebanese soldiers then executed some of them, by choosing to bite the hands that fed them Syrian rebels worked against the interest of Syrians most of whom did not do anything to hurt Lebanon and the Lebanese army. The US has so far been the largest donor to help refugees. Turkey provides full health coverage and free education to the million+ Syrian refugees there. EU has promised to accept 50k Syrian refugees in the next year, this of course does not count the countless illegal immigrant seekers that are pouring into the EU seeking asylum. What has Russia done? What about Iran and North Korea? Somehow the FOS with all their failings are doing a lot more than the supposed “allies” that are more than happy to provide bombs to murder Syrians but nothing to help them! Qatar and SA could easily accommodate all the refugees and they can afford building cities for them if they are really caring about Syrians,or may be they wanted only cheap brides from the camp. Evil has different shapes indeed. Just heard some news about suicide bombers in SA,congratulations. “Evil has different shapes indeed. SA should try the taste of its own medicine. Again I ask, as bad as the FOS has been; what has Russia, Iran, and North Korea provided to help the displaced, other than the bombs that displaced them? That is a drop in the ocean,they spend more in gambling ,fancy cars,women and plastic surgery,arms which they don’t have an army to use it. It would have helped if they didn’t interfere in Syria and try to liberate their women and provide medical treatment to their own poor and put their pedophiles in prison. Oil Crude Oil hits 50 USD. I wonder how will Iran keep on paying subsidies to half south Lebanon and chiia suburbs of Beirut. I wonder how will Iran keep on paying conversion subsidies to all sunnies who changed sect from sunna to chia in Syria and Irak starting in 2006. I wonder how will Iran keep on paying all shahada for life rewards to all militia shadidy men in Syria, Irak and Lebanon. I wonder how will Iran keep on paying all weapons used by Assad against population. I wonder how will Iran keep on supporting the Syrian Pound and the Assadistan criminal regime. I wonder how will Iran keep on trying to introduce its roots in Yemen and Oman. 1. You did not answer Sami’s direct question: what have the Russians, Iranians and others done as far as humanitarian aid to the Syrians? 2. So when someone provides you with aid, instead of thanking them you question them on how they spend the rest of their money? Why do you have to borrow Sami’s questions and give your post a lack of credibility,you can do better than that,you are much more creative. I personally don’t find that Hopeful borrowed anything, and definitely did not lose any credibility over your lack of answers. Just like me he was hoping to give you the benifit of the doubt that you can back up any of you assertions without throwing accusations and wishing suicide bombers on others. If anything you have proven with your juvenile answers, a lack of credibility and a complete waste of time to discuss anything with. Is there anyone,who can explain what are the goals of the US when they violate the Syrian sovereignty and the international law? Is there anyone has to lie as an addition to the disgusting american lying package? Need to be accountable to the American side about the outcome of the American comic bombing during the 2014 and violation of international law. It must be a Syrian assessment report of the results, in order to build on it to put America in front of the responsibility for this farce and claim to pay the prices. SA is paying for these American bombs with a lot of oils,so it is so cheap for them to start a new war any day. Your answer does not characterize the jasmine, but the wild grass! I honestly have no problem leveraging and borrowing intelligent useful posts. I do not have to come up with new things on my own. That is not my goal. My goal is to advance whatever can bring peace and prosperity to Syria. 1. Assad and his cronies are the #1 cause of the mess we are in. Unless they are gone, there is no hope for Syria. 2. Russia and Iran have done nothing for Syria except help the regime become more brutal, and directly getting involved in the conflict. They have done nothing for the Syrians. 3. ISIS, and other terrorists can only be fought and defeated if our countrymen are united. This will only happen if a political settlement, acceptable to both sides, is reached. The sooner we get there, the sooner we can hope to get rid of that cancer. Our country men are going through hard process of learning and making mistakes on the way,the Syrian political life is in its enfancy and they have a long way to go,we are so frustrated by the process after living in the west for a long time and we think that in a switch they can establish democracy,freedom,equality,human right basics. If we really care ,we should try to contribute to the building of Syria not only by stone and mortar,but by creating communication paths. We can’t even talk to each other for more than few posts without getting angry and exchanging insults. Intelligent questions deserve answers without intimidations. I agree with you that our country men can only save Syria by putting their differences on the side and reconcile and what Guffran is saying for the last 3 years is right. Solo and Bass. Bass and Solo in the endless Syria Comments symphony. Material from the Jewish writer followed by another done by Zionist, and from the third ones, who are sympathetic with both. It seems that the fate of US is the absolute allegiance to the Jews and Zionists and who is revolving around them. Now let’s try to get rid of what divides us and keep what unites us! Alan, there is no such thing as “Syrian sovereignty” anymore. Syria is no longer a nation. It is a train wreck waiting to happen and Bashar is the engineer. Saudi Arabia is on alert for jihadi attacks after a general and two other soldiers were killed by a suicide bomber in the first deadly assault along the country’s border with Iraq since it joined the US-led coalition fighting Islamic State. The interior ministry in Riyadh blamed “terrorist elements” for the incident early , but did not name any group, though it is thought likely to be Isis, which controls large areas of Iraq as well as Syria. Notice how Isis is a terrorist group when it attacks KSA but it is a rebel group when it attacks the Syrian army. Sites like aksalser and al-Arabiya have since 2013 fabricated stories about wins by the FSA when the attackers were Nusra and ISIS. It gets even worse, Khoja the new clown at the SNC, asked Nusra (the brothers of his MB friends who appointed him at the SNC)to distance itself from alqaeda to give KSA and Turkey more ammunition to classify it as a “moderate” rebel group!! ISIS here means chia operation led from Iran and Baghdad to punish the Saudi position regarding the new Persian Empire. AL QAEDA like ISIS is not a real social based party or organization. AL QAEDA and ISIS is what inteligence managers in Washington, Moscow, Damascus or Teheran decide what to be. So ISIS and AL QAEDA is the way they fight each other. ISIS is a US/IRAN creation. As a chiaa you should first know yourself and accept that the most sectarian islam is the one has decided to separate and declare themselves the owners of the pure message and world justice. As a christian I must say that repeating “we must protect minorities” is very nice and moral except when it implies that the majority must be under massacre and ethnic cleanesing. This is the case of Syria. Under the umbrella of minorities protection a great majority of population is being massacred, tortured and expulsed from its own lands and country, most sunna but many christians, ismailis, yazidis or even alawis will suffer just to justify that the criminal disgusting Assad Son of God is the less bad solution. Do you want to claim that the Syrians do not have a faith in their own land? Do you need to see more from the epics of girls Kobanî for example? Are you shortened the might of the Syrian nation by the stage of hybrid war? Nonsense! The American and international media with each passing month publish an increasing number of articles that expose the dubious nature of operations carried out by the Central Intelligence Agency, leading numerous international players to point out that the CIA should be banned, since there’s no more hope of reforming it. This position can be justified by the fact that for almost 70-year of its existence, the CIA has provided numerous American presidents with false reports on a number of crucial foreign policy issues, in addition to election fraud, toppled governments around the globe, and the sponsorship of dictators. The CIA is responsible for thousands of civilian deaths, countless torture cases and world-wide Orwellian-style surveillance. There’s a puzzling question as to why President Obama with nearly two dozen major intelligence agencies at his disposal to provide him with all necessary data and advice, would still need the CIA? Wouldn’t it be easier to wash America’s hands and save its reputation by cutting some 30 thousand CIA employees, and saving billions of taxpayers dollars? في السنتين الاولتين عودنا الاعلام الخليجي على تلميع اشخاص ممولين، تم شراء لائحات باسم بعضهم في المظاهرات السلمية لرفع مستوى شعبيتهم وقتها للايحاء بأن وجودهم بهذا الخطاب هو ارادة شعبية و هم عادة كانوا يستعملوا لمهمة واغلبهم تم توظيفهم رسميا فيما بعد في المواقع الممولة القيادية للثورة من ائتلاف لمجلس وطني او ما سمي هكذا و هذا لاعطاء خطاب اعلامي عبرهم للجماهير السورية الغاضبة يتماشى ليس مع مصالح سوريا بل مصالح الممولين على اختلافهم اولا و اخيرا..
أقول ما سميى ثورة لأن الثورات في العالم لحد الأن لم تدفع معاشات بالدولار لقادتها و لم توظف افراد بمكاتب، الثورة عملية تطوعية حيث الثوار في كل مكان هم المفروض اول المضحين و ليسوا متبجحين بلباس النعمة الحديثة الذي يهل به علينا اعضاء معارضتنا الثورية. نلاحظ باستغراب منذ اكثر من عام غياب اغلب تلك النجوم من عن “القنوات الزبائنية” و هذا رغم ان تلك الفئة قامت بدورها على اكمل وجه و قالت كل ما طلب منها ان تقول فشتمت و رفعت الصرامي تعاركت من على القنوات احيانا.. و اجريت للقادة حلقات خاصة بطقومهم و كرافاتاتهم الجميلة و القابهم المبتذلة.. و قالوا فيها كل ما طلب منهم ان يقولوا بما يتماشى مع مصالح تلك الدولة او تلك…و عموما اعضاءالائتلاف القديمين و الجدد هم كلهم من تلك الفئة من البشر و كم هم كثر في سوريا ..
لذا عندما نرى اليوم احدهم يظهر كثيرا و تظهر له صفحات دعم شخصية ” ادعموا فلان” بتنا فورا نتسائل من رجل الاعمال الذي ورائه ؟ و يا ترى هل جنسيته سورية ؟ هل هو اخوان ام لا؟ . Lama is questioning the legitimacy of the SNC and rebel leaders in Syria and accusing the clowns financed by Qatar, KSA and Turkey of being cartoon characters who care more about their tv appearances and their own well being than the welfare of the people they claim to represent. Timely article. With the SSNP becoming entrenched in Homs province, especially in old city Homs and Wadi al-Nasara, it will be interesting to see if/ how their leadership become more institutionalized within the Damascus regime. I am curious what role Ali Haider might play beyond his role as Minister of Reconciliation. Will Joseph Sweid be giving a larger role in the cabinet as well? With Wadi al-Nasara being firmly controlled by the regime, will their militia (SSNP, and Christian members of the National Defense Force) participation in regime politics increase? I ask these questions because although Christians make up only around 5% of Syria’s population, within Assad’s Syria (circa 10 million total population) they seem to represent around 10% of the population.